Bing's market share in search, compared to Google, is actually smaller than Safari's share of web browsers in comparison to IE, according to statistics collected by Net Applications. A historical analysis of Microsoft's web search brands published by RoughlyDrafted shows that the news fervor surrounding Bing is wildly overstated. 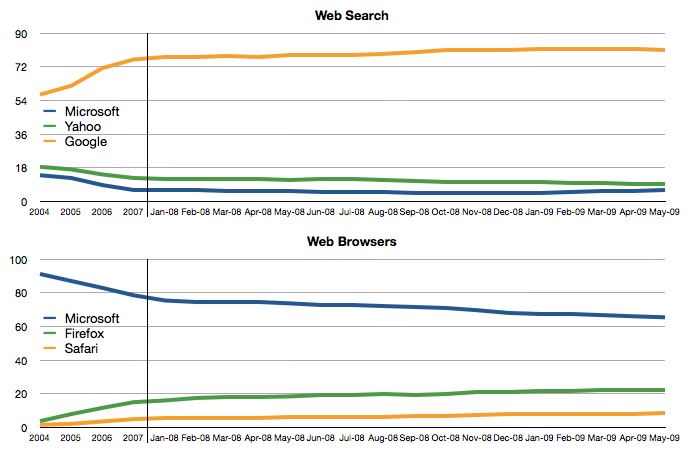 Few pundits are issuing weekly updates on Safari's progress over Internet Explorer, yet Safari has incrementally advanced over the past five years, rising from a 1.5% share of the browser market in 2004 to the current 8.5% share, based on historical web statistics published by Net Applications. In contrast, Bing, the latest version (not unlike Safari 4.0) of Microsoft's search websites, represents a business that has actually shrunk significantly since 2004. Microsoft's combined search properties, including MSN Search, Live Search, Windows Live Search, and Bing, dropped from a 14% share of search in 2004 to the current 5.9%. The graphic below shows Net Application's historical figures for the top three web search and web browser vendors (Microsoft's search properties are combined together). The left end of the chart shows an annual scale, the right end shows monthly scale. Google is consistently increasing its share of web search despite Microsoft's bundling of search with Windows, while IE is dramatically losing share despite its monopoly-tying.